Gaylor Lakes and Gaylor Peak are located near Tioga Pass in Yosemite National Park. This trail offers some excellent alpine terrain and scenery, without having to hike very far to get it. A trip to the lake is only about two miles and 700 feet of elevation gain round trip. The trail also puts you within striking distance of Gaylor Peak, and a great chance to climb an 11,000 foot tall mountain with fairly minimal effort. Our family made the hike to Gaylor Lake during a long National Park road trip and really enjoyed it. The skies were a bit overcast, but nothing we couldn’t handle. From Tioga Pass, the trail climbs steadily up the hillside, passing through forests and meadows along the way. After about 500 feet of climbing, the trail crests the ridge and provides some amazing Sierra views. Once at the crest, my wife and sons continued on down to the first Gaylor Lake. But I took a side-trip up Gaylor Peak. The climb of Gaylor Peak was pretty straightforward. Quite a bit of talus to cross, and a couple large snowfields as well. But no major obstacles. From the summit, I had excellent views in all directions. At one point I thought I could make out my wife down at the lake wearing her bright orange Boise State sweatshirt. I didn’t linger on the summit long before hustling back down to the trail and then down to Gaylor Lake to meet my family. Gaylor Lake was very pretty. I was impressed by being such a great alpine setting so close to the highway. We hung out at the lake for a short while, snapping a few photos and enjoying the views. But soon enough it was time to hit the trail again. We made the 200 foot climb back up to the saddle, then did a leisurely hike back down the trail to Tioga Pass. Map of the route, just over two miles and 700' elevation gain round trip for the lakes. 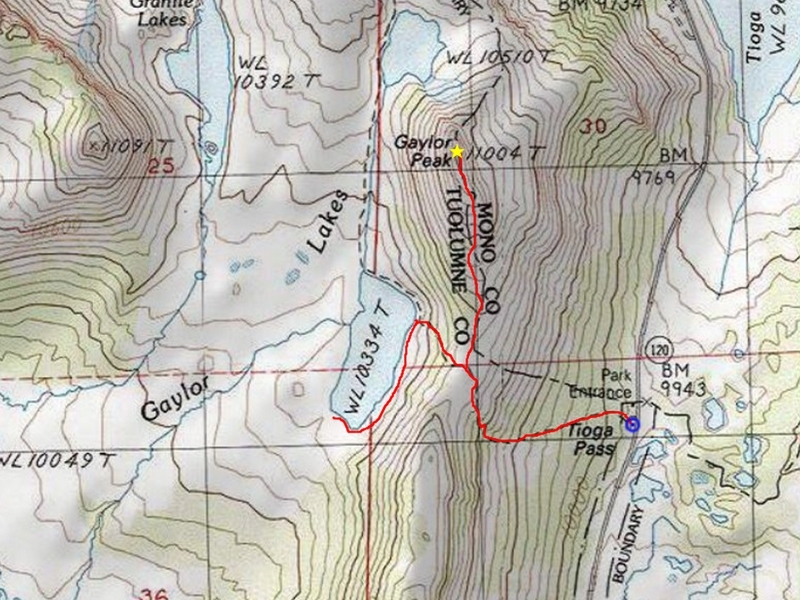 An additional mile and 500' elevation gain to if you include Gaylor Peak. Crest on the ridge before dropping down to Gaylor Lake. Me on the summit of Gaylor Peak, with Gaylor Lake below. Gaylor Peak summit view of the Granite Lakes and False White Mountain. Taking a break at Gaylor Lake, with Gaylor Peak in the background. Panoramic view from the south end of Gaylor Lake. Gaylor Peak on the right. Panoramic posing at Gaylor Lake. Taking a break in the trees. Crossing the crest on the way back down to Tioga Pass. Heading down the trail back to Tioga Pass.